It is next to impossible to whittle down a rich abundance of great Ashes Test matches to a few number. But after a bit of deliberation and taking into account the closeness of and the context surrounding a contest, eight matches were finalised. In this first of a three-part series featuring some of the greatest Ashes Test matches played over the course of its history, we look back at two nineteenth century classics. Strictly speaking this Test was not part of an ‘Ashes’ series. However, not including it in this list is completely out of question as this one-off Test was indeed the match which proved to be the genesis of the Ashes. This was only the second Test to be played on English soil, the first being in 1880 at the same venue which was won by England by five wickets. Just a few months earlier in the 1881-82 season, Australia had beaten England 2-0 at home in a four-Test series. Prior to the start of the 1882 match, only eight Tests had been played in all. This Test was a three-day affair consisting of four-ball overs. Australia, under Billy Murdoch, were rolled over for just 63 in 80 overs after deciding to bat. The medium pace of Richard Barlow (5/19) and the slow left-arm spin of Ted Peate (4/31) did the damage. By the end of the first day, England themselves were bowled out for 101 with fast bowler Frederick ‘Demon’ Spofforth taking 7/46. George Ulyett’s 26 for England was the only score of above 20 on an astonishing first day. Trailing by 38 on the first innings, Australia then had a much-improved start to their second innings on day two. Openers Alec Bannerman and Hugh Massie put on 66 for the first wicket. However the former’s dismissal led to a collapse, with Peate (4/40) wrecking the middle-order. Australia were all out for 122 with Massie’s rapid 55 (from only 60 balls) being the only half-century of the match. England needed only 85 and everyone at the ground expected a comfortable win. Despite two early wickets to Spofforth, there were no signs of panic in the English ranks as they cruised to 51/2 with the reliable pair of William Gilbert Grace and Ulyett in the middle. However Spofforth was in his element and he provided another breakthrough, having Ulyett caught behind. Then with the score at 53 came the fourth wicket and possibly the moment which made Australia believe. Grace hit one to mid-off only to be caught by Bannerman off Harry Boyle for 32. Even then, Bunny Lucas and Alfred Lyttleton took the score onto 66/4, with only 19 more to win. The ‘Demon’ then proceeded to rip through the English batting. Already having three wickets, he bowled Lyttleton, caught Alan Steel off his own bowling and then castled both Maurice Read and Lucas to reduce England to 75/8. The tension was getting higher as the crowd began to realise that defeat for England was becoming a real possibility. Boyle ensured that Spofforth’s spell did not go waste as he snapped up the last two wickets, the game ending with Peate getting bowled. England were bundled out for 77 and lost by seven runs. Spofforth took 7/44 to finish with 14/90 in the match. The game was over within two days. England had lost their last eight wickets for just 26, a collapse that shocked the public who had seemingly taken an English win for granted. The anxiety at the Oval was so palpable in the dying stages of the game that one spectator named George Spendlove died of heart failure moments after Australia ended their second innings, while another reportedly chewed through the handle of his umbrella! 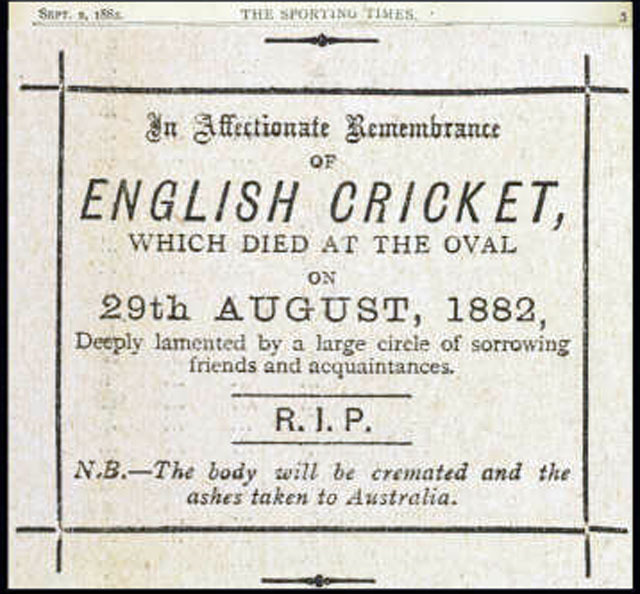 In affectionate remembrance of English cricket which died at the Oval, 29th August, 1882. Deeply lamented by a large circle of sorrowing friends and acquaintances, R.I.P. N.B. The body will be cremated and the Ashes taken to Australia. This piece attracted a lot of attention throughout England and when the Hon. 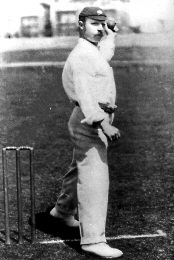 Ivo Bligh embarked upon a voyage to Australia, captaining an English side for a Test series in the coming winter, he declared that he and his men would be trying with all their might to beat the Australians in the scheduled three matches and bring back the ‘Ashes’. The Australian public, however, were not aware of what the ‘Ashes’ meant. After arriving in Australia, Bligh was introduced to one Miss Florence Rose Murphy of Victoria at a social event in the week before Christmas. Later, when England overturned a 1-0 deficit to win the three-match series 2-1 (a fourth Test was later added, won by Australia), Miss Morphy got together with some of her girlfriends to present the winning English captain with a little urn to commemorate his side’s triumphant reclamation of the symbolic prize. It is not known whether the urn contained remains of a burnt ball, a burnt bail or Morphy’s burnt veil – but it surely was an ashes urn. Morphy married Bligh in 1884 and upon the death of her beloved husband in 1927, she made a gift of the precious original urn to the MCC. Since then it has been on display in the Lord’s cricket museum. England became the first holders of the Ashes in 1882-83 and thus began the story of an epic series which till date manages to captivate fans from not just England and Australia but from all around the world. In a world of short attention spans and demands of diluted Twenty20, the Ashes stands strong. Today it is the only Test fixture which has a uniform five Tests in every series, providing the importance of tradition and the aura of a time-tested rivalry which has been Test cricket’s most-awaited for the past thirteen decades. England, under Andrew Stoddart, created history by becoming the first team to win a Test after following on with a thrilling ten-run victory in the opening game of the 1894-95 series. Australia piled up 586 after electing to bat, recovering from a triple-strike from Tom Richardson (5/181) which had left them tottering at 21/3. George Giffen (161) and Frank Iredale (81) put on 171 for the fourth wicket. Giffen added a further 139 for the fifth wicket with Syd Gregory, who went on to make 201. Gregory, along with Jack Blackham (74) boosted the total with a 154-run stand for the ninth wicket. England’s reply was built around Albert Ward’s 75 before Johnny Briggs’ rearguard 57 lifted the team from 211/7 to 325. Giffen starred with the ball too, taking 4/75. With a lead of 261, home captain Blackham enforced the follow-on. 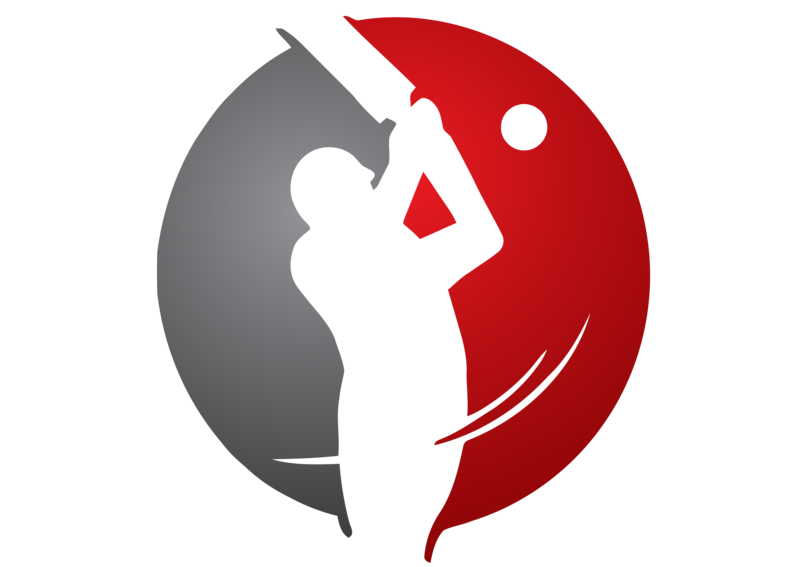 England showed better application the second time, with Ward top-scoring again with 117. He added 102 with Jack Brown (53) for the third wicket. The lower order performed again as England went from 296/6 to 437, thereby setting Australia a target of 177. At the start of the final day’s play, Australia looked comfortable at 113/2. During the night it rained and it was followed by sunshine the next morning. This altered the conditions of the pitch significantly and the slow left-arm orthodox bowler Bobby Peel came into his own on the ‘sticky dog’. So did Briggs, another slow-left-armer. The duo began to make serious inroads in the visitors’ line-up. Australian nerves tightened and England had their tails up. From 130/2, Australia crumbled and were dismissed for 166, losing the Test by ten runs. Peel took 6/67 while Briggs collected 3/25. Australia’s 586 remains the highest Test total in a losing cause till date.